With their latest San Diego Comic-Con 2014 Exclusive, Gentle Giant has revealed a truly fantastic item. Many long time Star Wars fans know the story of R2-KT. For those that may not know, R2-KT a droid created by a loving father for a young girl by the name of Katie Johnson, who always wanted a pink droid like R2-D2. Katie, sadly, passed away at the age of just 7 years old. Her legacy lives on in the form of R2-KT, as the droid visits children and helps to raise awareness of childhood cancer. You can read more at the R2-KT Home Page. 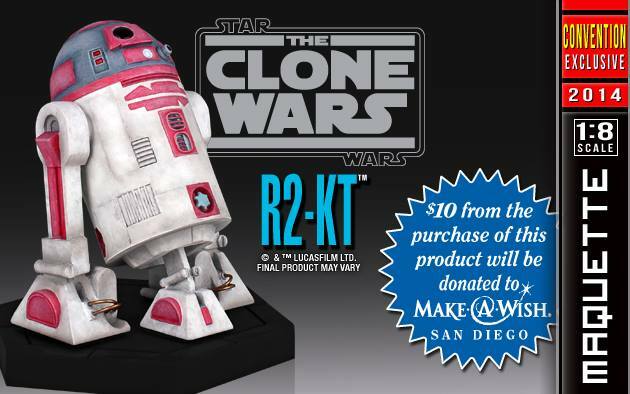 The R2-KT Maquette by Gentle Giant will help raise awareness even further. With every purchase, $10 will be donated to San Diego Chapter of the Make-A-Wish Foundation. See more images and get more info by reading on.